Our Program in 60 Seconds! Create your own design in 3D! Add custom text, shapes, graphics, and more! Finally make EVERYONE happy with our Minimums PLUS™ program! Mix ANY core product at ANY performance level and option into your order. Mix multiple fit types so everyone can get a great fit! Now you can make sure everyone gets the right fit, and no one has to sacrifice comfort so the ‘group’ can make a minimum! Our program offers the most flexibility to any with options to mix 3 fitting types into your order at NO EXTRA CHARGE! Multiple performance levels to meet the needs of novice to tour pro's! With many members on a team, there are usually many diverse needs. We’ve solved this problem by allowing clubs and teams to offer multiple performance levels of gear to their members. Now your members get the gear they need and want, without having to sacrifice performance or their pocket book! Serve novice to Tour Pro’s at one place! Lose the frustration of gathering orders and collecting money manually! With our convenient online team stores, every member can pick their products, choose their sizes, and pay instantly online without any hassle. You can monitor orders and see reports to make sure you know what’s happening! Members simply place their orders individually! Your members select their products, pick their sizes & options, and pay all in one simple step freeing you from having to do all this work! Orders can shipped together or have members get theirs shipped direct! Have members all over the state or country? Just don’t want to go through the hassle of distributing new gear? Our online stores give your members the option to have them shipped individually direct to them making things really easy! Online stores can be used to raise money for your club or team needs! Our online stores give you the option to mark up or down pricing so your cycling club or team can raise money for events or even administration needs! It’s simple and after your order is placed you get a check or paypal transfer for the amount right to your account. You can even monitor fundraising from your account! 3 – Your One Stop Shop! Get great quality, service, and ALL your products in ONE place! Professional grade quality now available to you! All of our products are manufactured with professional grade techniques and processes to ensure you get amazing quality! Our technology partners mean that you get the latest technology incorporated into our fabrics and materials for the highest performance and comfort. Forget frustration and get friendly personal service. Everything your group needs from novice to Pro! We have a full line of products including the tough to find ones like socks and gloves! Not only that, we also have different performance levels to meet the needs of a diverse group. So now your weekend warriors and semi-pro athletes don’t have to order the same gear! FREE FULL SERVICE DESIGN SERVICE… See over 300 examples here! Other AWESOME Reasons to work with us! Use our NEW Fluorescent & Neon Hi-Vis Colors to stand out! Make your gear really pop with the latest technology in Hi-VIS ink. Colors explode for awesome looks and for added safety! Nothing gives your gear the next level edge like Hi-Vis. Complete FULL SERVICE professional design team at your disposal! You’ll receive a personal design artist that you can work with directly to create the design of your dreams and these Award Winning designers will make it reality for you. Best yet, it’s 100% FREE, and we offer UNLIMITED REVISIONS so reach out to us today so we can get yours started! We combine world-class quality with affordable pricing that isn’t matched anywhere else in the industry. When you use Ascend Sportswear your dollar goes farther and you get more features for less money than anywhere else! Contact us today to get samples and see what we mean. Keeping things simple and easy is our motto. Our pricing follows this by being ALL-Inclusive, meaning you won’t find any hidden fees, set-up fees, or other misc. charges when you work with us. The price you see online includes EVERYTHING down to design, set-up, production, and even shipping! We’ve spent years refining how to make this process easy and stress-free for you! We don’t have complex terms & conditions, and we try to do EVERYTHING we can to take the load off of you. Most importantly though, we’re just friendly people who want to give you an awesome customer service experience, so give us a try! We know you won’t regret it. 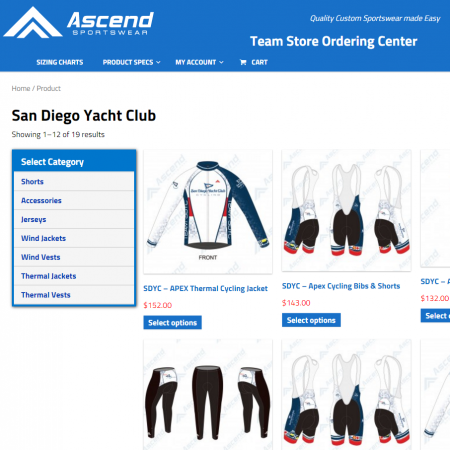 Ascend Sportswear offers the most competitive custom cycling jersey program out there. We are dedicated to supplying you with the highest quality custom cycling jerseys and gear available at the most competitive pricing. Please view our price list for custom cycling jersey pricing. Our custom cycling jerseys are made from the highest quality materials and sewn with care for durability and performance. Each custom biking jersey is inspected for quality and precision. Don’t have a design? Ascend Sportswear designers will take your custom cycling jersey design concept through our multistep design process. Our professional designers will make sure that your custom cycling jersey design matches up with what you had in mind. Each step is to make sure your completely satisfied with your custom design through design consultations. You’ll speak to a live person regarding your custom cycling jersey with Ascend Sportswear rather than just an Email or form! Furthermore, Ascend Sportswear offers an incredible custom cycling jersey program for charity events! We support teams with custom biking jerseys in a variety of events like BikeMS, Tour de Cure, the Habitat 500, and many other great charity events. We’ll produce unique vibrant custom cycling jersey designs to suite each specific team needs. Our designers have been known to get truly creative with these custom biking jerseys and gear so your team can make a statement and stand out in the crowd!